Release attached dirt and grime contaminants from the bodywork without touching the surface. Pure Definitions snow foam is developed to remove the majority of dirt and grime before washing the vehicle with a washing mitt - significantly reducing the chances of producing swirl marks while washing. 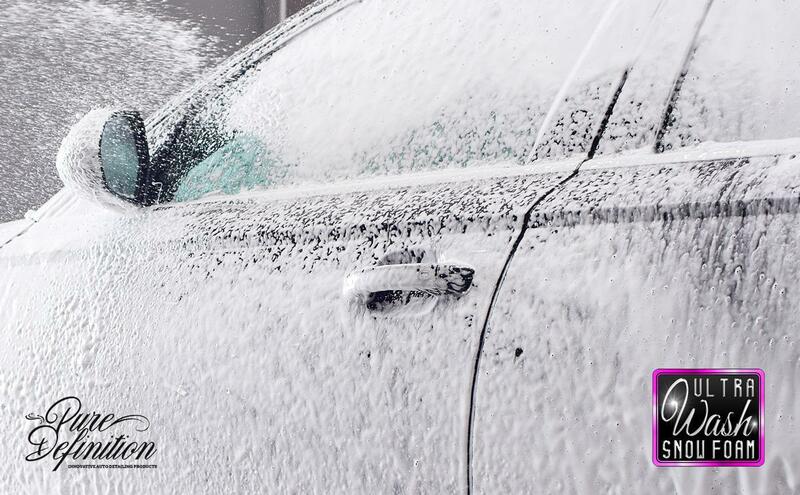 Ultra Wash Snow Foam is a unique blend of specialist biodegradable active agent detergents which provide superb foaming when applied via a snow foam lance. Ultra Wash Snow Foam can be applied manually or using a snow foam lance. Ultra Wash Snow Foam creates a layer of foam on the paintwork which enables the advanced active cleaning agents to stay in contact with the surface for longer than regular washing. This creates a higher cleaning rate from the advanced active agents which break down contamination on the paintwork, loosening dirt and grime which are rinsed off afterwards. Ultra Wash Snow Foam before washing the surface by hand reduces the risk of creating fine scratches and swirl marks on the paintwork. Additionally, it enables the advanced active cleaning agents to get into gaps and crevices which are hard to reach. Ultra Wash Snow Foam should be applied before washing the vehicle by hand to remove any loose dirt and grime. I bought 5litres this week. Very foamy and did a good job. A little goes a long way, approx 50-100ml in your Snow Foamer will be more than enough. Nice product.. Tony. Firstly, pour water into the snow foam lance and then top up the bottle with Ultra Wash Snow Foam, ensuring the desired dilution ratio is calculated. Then adjust the settings on the lance to suit your personal preference. For manual application dilute 50:1 with water in a trigger bottle or foam sprayer and apply directly onto the paintwork and leave the formulation to soak on the surface for 10-20 minutes before rinsing off with water.